Imagine walking down an empty corridor one night and you come across human limbs covered in what looks like spider web dangling from the concrete ceiling. Just when the fear starts crawling through your skin, you hear the sound of footsteps behind you. You turn your head and behold! There's a gigantic mutant spider heading right into your direction. What would you do? Run of course! Who in their right mind would wish to be near such a despicable creature. 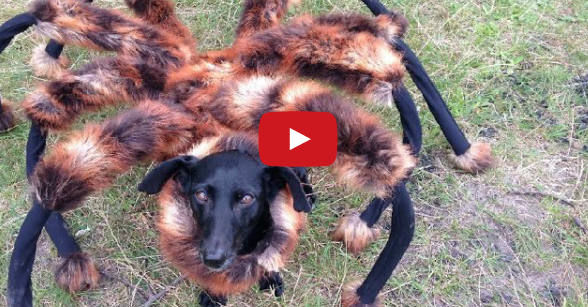 A prankster based in Poland who goes by the name SA Wardega on YouTube brought this scene to reality when he dressed up a dog as a giant spider and had it roam the streets in a city there. To make the experience more frightening, Wardega set up props within the vicinity where the dog roamed. These props include human hands and legs wrapped in webs dangled in subway ceilings. Sure, it was scary for the hapless victims of the prank. Fortunately for us internet folks, we can only watch them and laugh our heads off. The dog in the prank has a name. Her name is Chica and you can learn more about her on her Facebook page. For more pranks by Wardega, check him out on YouTube. They have a collection of awesome pranks there that you can watch over and over again. Pranks that the Wardega team took a lot of time to set and pull off. Aside from unsuspecting citizens, their prank victims also include cops and more.